One last burst of exploring the city – left to my own devices and full of confidence, I returned to Grand Central station, and this time headed North. So what was on my agenda? Thursday was about research and…. a bit of a ‘business meeting’…….. 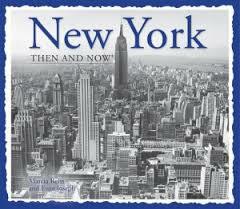 Throughout my posts about my New York visit, I have commented very little about my writing/novel. 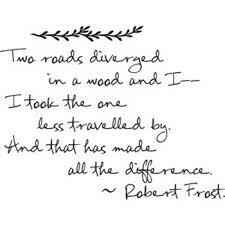 This day was being driven with both in mind. Whether it is an idea for plot or character for the next book or if it is a whole new book for another time, I felt New York would give me inspiration. But, again, I wasn’t choosing the usual tourist path. I LOVE history now- not the big stories per say, but more the stories behind the big stories. I also find, that from a writer’s view, when I hear a date, I find my mind relating it back to Kylemore. What was going on there at the same time? So for example, when construction was underway at Kylemore Castle in 1867: the International Exhibition was opened in Paris – Jesse James was busy robbing a bank in Missouri – Karl Marx had just published ‘Das Kapital’ – The widow Queen Victoria laid the foundation stone for the Albert Hall – the Medicine Lodge Treaty was signed between US/Native American Indians – the Fenian’s were organising a Rising in Ireland……. Needless to say the list could go on. Did you know that 1867 was also the year Charles Dickens gave his first public reading in New York at Steinway Hall? Anyway, for research there was a few places I wanted to visit, to ‘put my eye’ on the locations that I had read about and filed away. 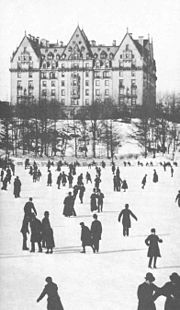 New York is a pulsing city today – what was it like during the late 1800’s and early 1900’s? Here is what I did NOT get to see. I had missed an opportunity to get to the Tenement Museum – note: you can only visit here while escorted by a tour guide and that has to be pre-booked. AND I also messed up on getting to the Merchant House (it is open Thursday – Sundays) AND with the week that was in it, Ellis Island was totally booked out! 😦 All/any of these, would have been a fantastic opportunity to see how people lived (and died) during the late 1800’s etc in New York. I was very disappointed not to have been able to visit them. I have promised myself to get to them on my NEXT trip to New York! We do have comparable tourist experiences here in Ireland: Living The Lockout, for the tenement side of things in Dublin, and our own Cobh Heritage Experience for the Famine Ships, Titanic and Lusitania stories, and of course we have our own fine examples of the Big Houses, Kylemore and Muckross House being two of them. But would they be a similar experience? I did get to seek out some places on my list for New York. One was the Dakota building (built between 1880 and 1884) – I had recently finished a great time travel book (recommended by Stephen King) – Time and Again by Jack Finney, where the Dakota was used in the book as the base for time travel – the building reportedly got its name from being built so far on the Upper West Side, that it might as well have been in Dakota. Of course the building now sits nice and snug, blending in very comfortably with its’ towering neighbours….. I had great fun finding it, and then wondered what stories IT could tell. 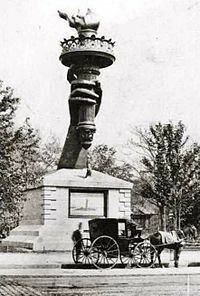 On a side note, did you know that prior to establishing the Statue of Liberty on Liberty Island, that her torch bearing arm was first exhibited at Madison Square Park? The story, as I understand it, is that the state couldn’t afford to build a base and erect the statue and so the arm was on display instead, tourists paying to climb up into the torch, while fund raising continued. For lunch I meet with a ‘Certain Someone’. Now this person shall remain nameless as I do not want to identify them in this blog, until such time that they advise otherwise. And as casual as it may have been arranged, it was actually a PR exercise for me to push the idea of my book and for ‘He who shall not be named’ to put a face and character to my name. In case you get too excited, they are not an agent/publisher or an author even, but they are in the industry and lets just say they were doing me the favour by giving me some of their very precious time. On the surface it was all very relaxed and easy going, but I have to admit I was nervous and very conscious of not coming across as too cocky, or too wishy-washy either. I had about 30 minutes to talk up my book and me, without appearing pushy and needy. As a result the first 20 minutes we talked about everything BUT the books and my writing – and the last few I had my ‘window’ to try and capture the very essence of what I was all about and where I wanted to bring my book series ‘K-Girls’. It was my first real ‘pitch’ without trying to make it sound too obvious that that is exactly what it was! I think it went very well – not to any degree of signing any book deals but I certainly got some interesting feed back, picked up a professional tip or two. I think they went away reasonably impressed, not just with my book series idea, but with me too! If they go away thinking this girl has some good ideas that go beyond the traditional, and they drop my name in their professional circles, then I would be very happy with that. We shall have to wait and see what outcome, if any, comes out of that. Meeting over, I sauntered for a bit near by and I have to say I was in my total element when I found this little Gem – not a building – but a book of buildings! Fab imagery of New York back in its early days, with comparison shots from modern day – (hats off to author Marcia Reiss and photographer Evan Joseph) I had great fun finding some of the buildings within and making my own comparisons. 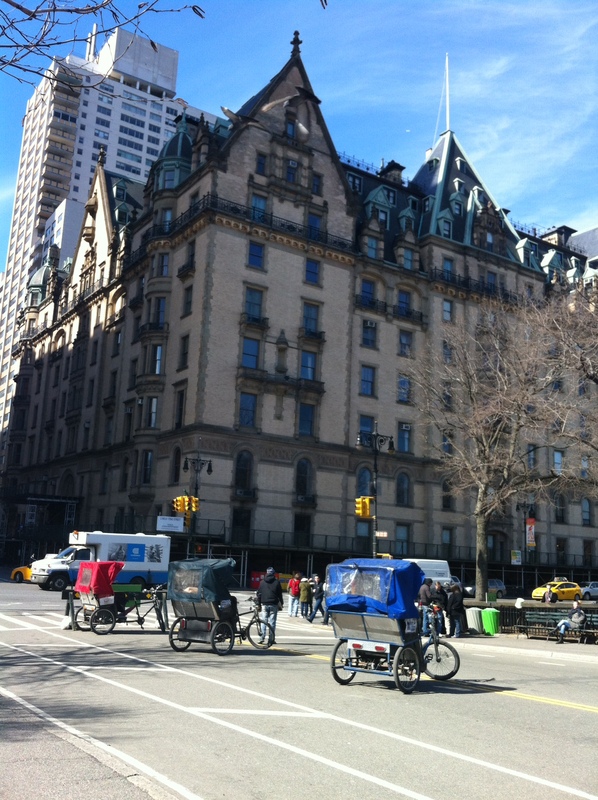 As a result, I walked miles around the city and felt I even did my own bit of ‘time travel’ …….the weather was glorious and I got to walk across Central Park (where the pond was still frozen) and ‘popped’ in (how naive was I) to the Met Museum. I would need a whole new trip to New York to get to see everything there. Oh how weary was I by the end of it all – how wonderfully wonderfully weary. 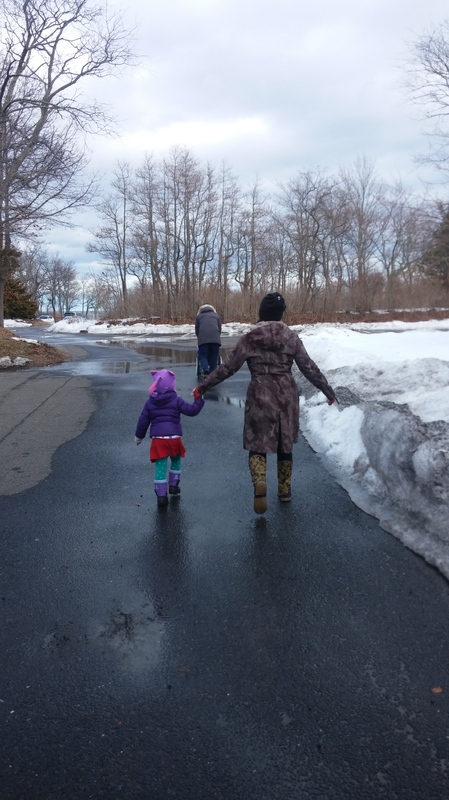 At the end of the afternoon, I made it ‘home’ to Mamaroneck with blistered feet and a very happy soul. The next day was ‘Going Home’ day and so I spent it with my hosts, dear friends – and I will always appreciate those last few cuddles on the couch, from my beautiful and pixie-like god daughter ‘Berry-Boo‘. I arrived home to Ireland in one piece – and I have to admit I was very happy to see the familiar patchwork green fields from Aer Lingus just before we set down in Dublin. My trip was – oh there is no denying it – AMAZING – as cliched as it sounds. I would like to think that my one was one with a difference – I hope my last few posts have caught some of that. I got to New York didn’t I?